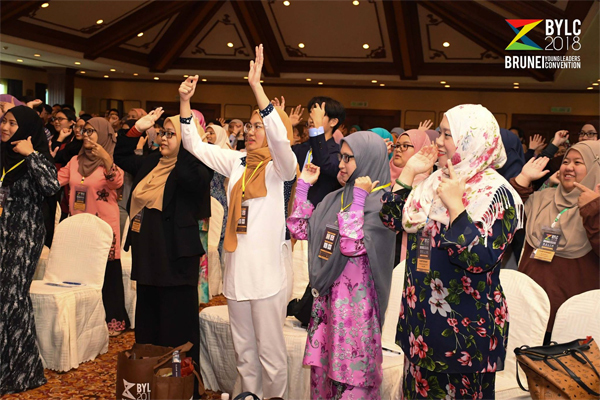 Brunei Young Leaders Convention 2018, organized by AlHuffaz Management and Generasi Bekarih, led by member of Legislative Council, Yang Berhormat Awang Iswandy bin Ahmad has started yesterday, 7 August at Goldstone Ballroom, Centrepoint Hotel, Gadong. Present as the guest of honour for the launching ceremony and presentation of appreciation certificates for the supporters and sponsors were the Minister of Prime Minister’s Office, Yang Berhormat Dato Seri Setia Haji Awang Abdul Mokti bin Haji Mohammad Daud. Attending the launching ceremony were also Yang Berhormat Siti Rozaimeriyanty binti DSLJ Haji Abdul Rahman, Yang Berhormat Nik Hafimi binti Abdul Haadii and Managing Director of Yayasan Sultan Haji Hassanal Bolkiah, Dato Paduka Awang Eddie bin Dato Paduka Haji Sunny. Recital of Surah Al-Fatihah and Doa Selamat was led by the vice co-chairperson, Ustaz Haji Mohammad Loqman Al-Hakim bin Haji Hamdan. He mentioned in his speech that in order to shape the future of the country, youth should grab any opportunities, explore and always look for any opportunities that were offered. 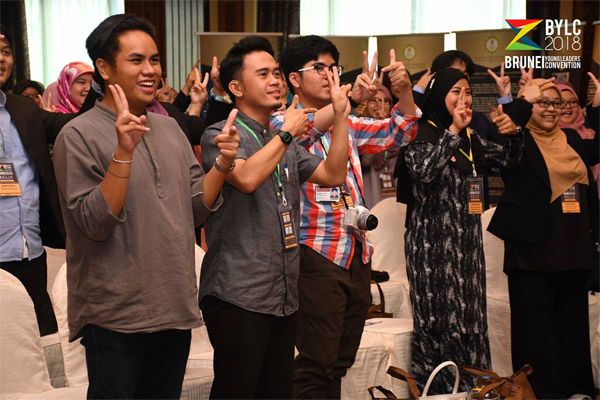 Youth were encouraged to take a deeper understanding of ‘Belia Aset Negara’ because youth are the valuable future assets which would determine the strength and leadership of the future generation as well as the country. “Kenali siapa kita dan jangan lupa asal usul diri kita. 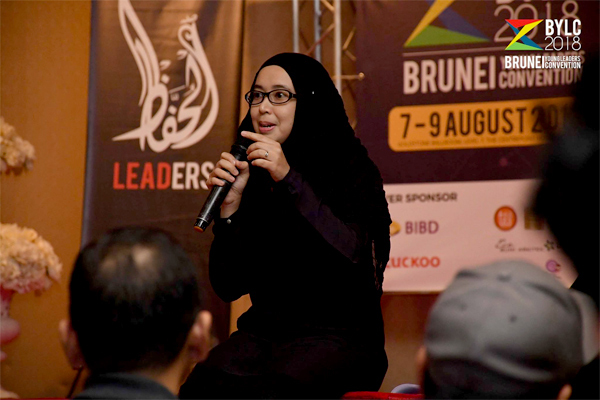 Negara Brunei Darussalam adalah negara yang memegang teguh falsafah dan konsep Melayu Islam Beraja, sebagai sebuah Negara Zikir dan ‘Baldatun Thayyibatun Warabbun Ghafur’. 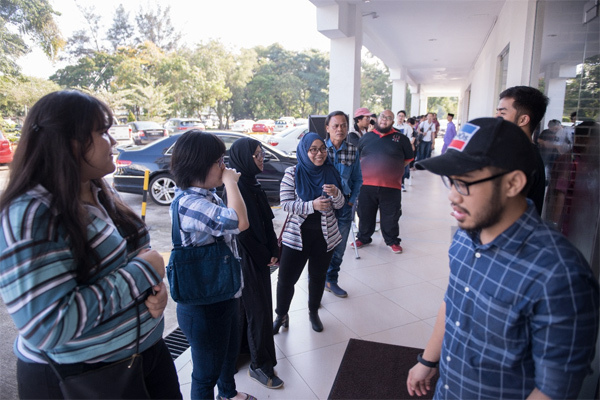 Kukuhkan dan kekalkan nilai-nilai keBruneian dan jati diri sebagai bangsa Brunei dalam diri para belia kerana ianya mampu memupuk dan menjiwai rasa kepunyaan atau sense of belonging, dan menanam semangat patriotism yang kukuh. Itulah calak Brunei, itulah purih Brunei. 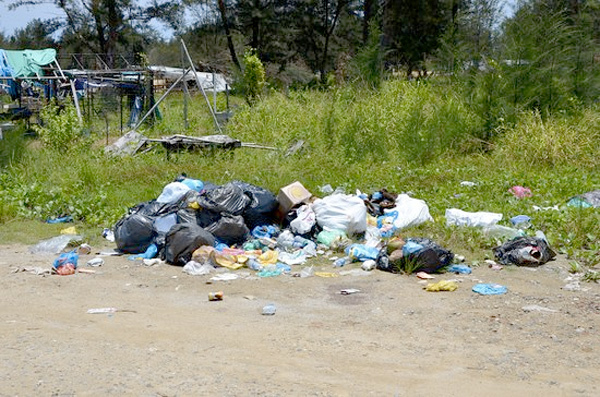 Dengan adanya sikap dan sifat semacam ini, maka sudah tentu para belia tidak akan mudah terkeluar dari ‘Acuan KeBruneian’ dan jangan mudah hanyut atau tergelincir dari ‘Landasan keBruneian’,” he added. The ceremony proceeded with a keynote on Wawasan Brunei 2035 which was then delivered by Administrative Officer Special Grade of Sekretariat Tetap Wawasan Brunei 2035, Yang Mulia Muhammad Aziman bin Haji Awang Nasir. Youth snapshot was then conducted by Ministry of Culture, Youth and Sports. In the afternoon, the convention continued with a session titled “Be The Change”, held by Centre for Strategic and Policy Studies (CSPS). The first day ended with a networking session for the mentors and all participants. 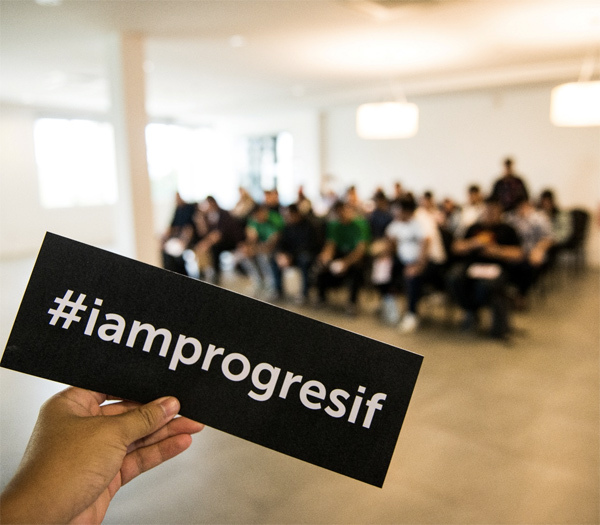 A total of 200 participants, aged between 18 to 40 years old are taking part in the convention which will continue for three days until 9 August 2018. 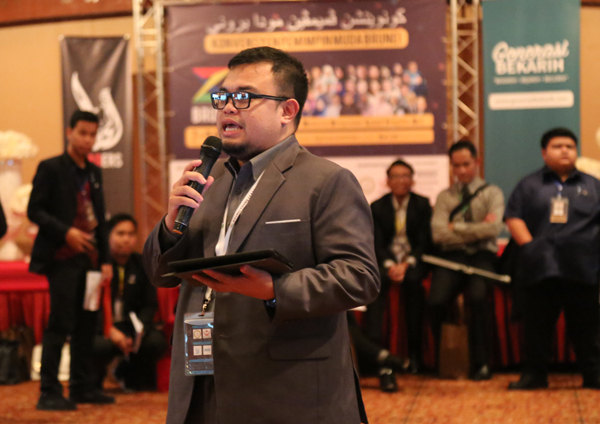 Brunei Young Leaders Convention 2018 is held for the first time and it aims to deliver accurate and updated information regarding Wawasan Brunei 2035, to unite relevant youth development agencies as well as to provide platform for youth to carry out projects or programs that might support and achieve Wawasan Brunei 2035. 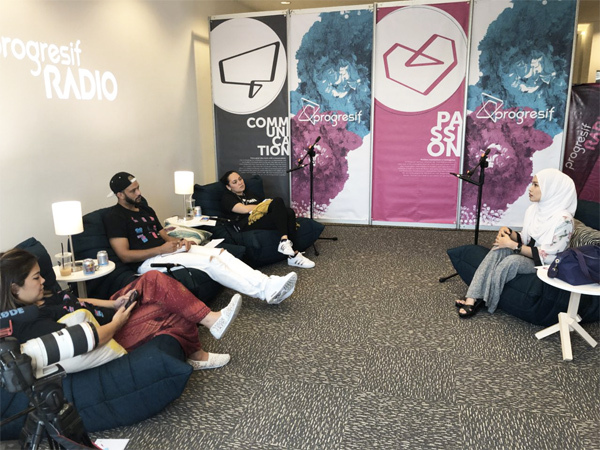 In addition to attending forums, participants also have the opportunity to interact and build network with the mentors which comprised of experienced youth regarding their future plans prior to attending the convention. 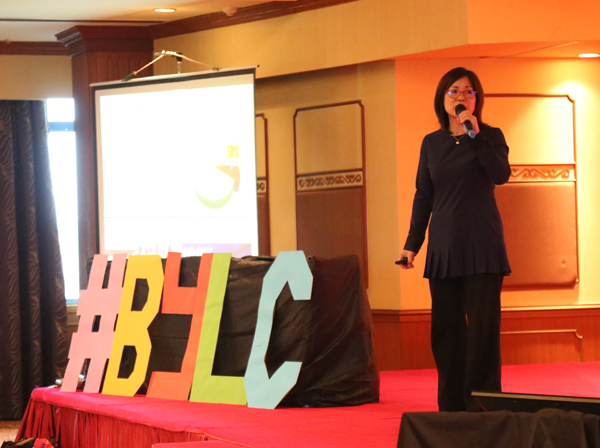 For more information and updates regarding the convention, visit www.bylconvention.com or follow the BYLC 2018’s official social media accounts on Instagram/Twitter (@bylconvention) and Facebook (Brunei Young Leaders Convention 2018). Some of the images courtesy of their event Facebook page. Where do you see yourself in 10 years? A vision/a goal that many of us choose to ignore. There were around 200 participants who signed up for the convention. Amazing start!! 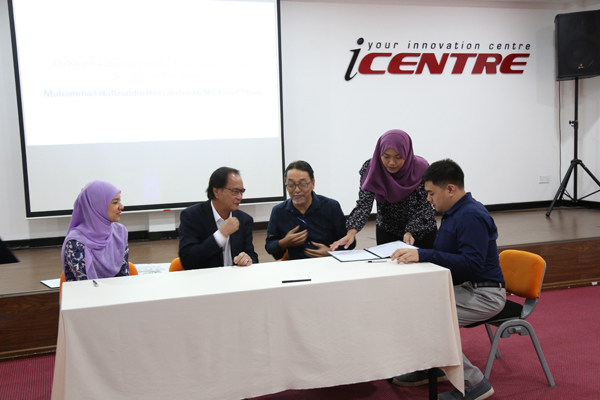 An-Nur Harapan Sdn Bhd honoured recipients of the scholarship to the UNIKLEARN Autism Vocational Training & Internship programme in a signing ceremony held at the iCentre in Anggerek Desa this morning. 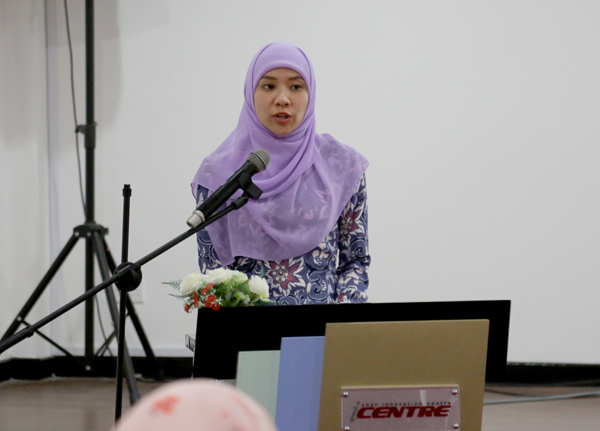 The scholarships are funded by An-Nur Harapan Sdn Bhd and Progresif Cellular Sdn Bhd. Present as the guest of honour to handover the scholarships to the recipients was Yang Mulia Pengiran Haji Salleh Ab Rahaman Bin Pengiran Haji Damit, Chairman of An-Nur Harapan Sdn Bhd. 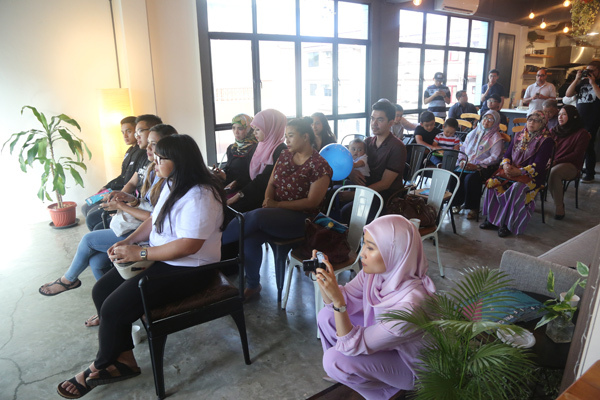 The event began with the recital of the Al-Fatihah prayers, which was followed by welcoming remarks by Startup Brunei Project Manager, Rasyidah Samah, and a speech by An-Nur Harapan board member, Noorsurainah Tengah. 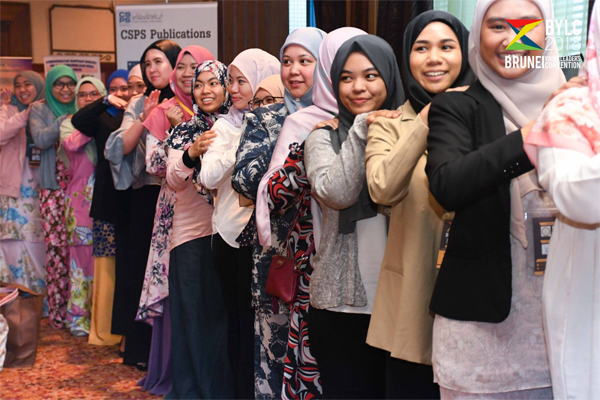 Muhammad Zulfadzli Bin Haj Matali, Mohd Syahmi Bin Haji Juma’at, Muhammad Hafizuddin Hussain Bin Haji Md Yusuf Thani, Md Firdaus Bin Haji Jimidin, Muhammad Syahrul Izzam Bin Asmat were selected based on several criteria have each received scholarships to attend the 6-month programme that will commence on 12 June 2018 at the SPARK Lifeskill Centre in Jangsak. The signing ceremony was to recognize the first batch of the UNIKLEARN Autism Vocational Training & Internship Programme. The next batch is slotted to commence in December 2018. 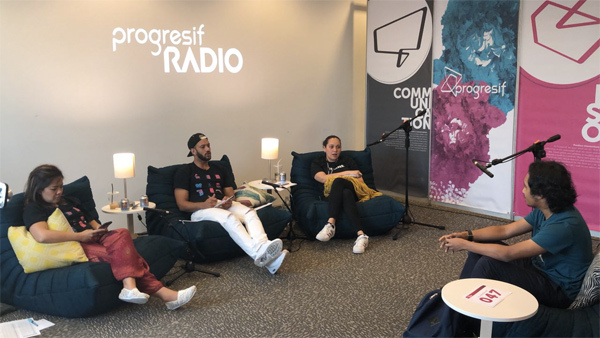 Noorsurainah further added that “the goal, ultimately, is to become partners with the clients, scholarship recipients, their parents and guardians, private and public sector and the community as a whole to increase student intake, capacity and job placement. To put it simply, to be part of society by recognizing both their strengths and weakness, and working with them, as we would anyone else. It starts with these 5 trainees at Uniklearn, then their placement at an affiliated training ground Unikkone, and finally gainful employment”. The UNIKLEARN programme is a vocational training and internship programme designed by professional therapists for autistic youths with the overarching mission to empower young adults with autism towards independence and be contributing members of the community. 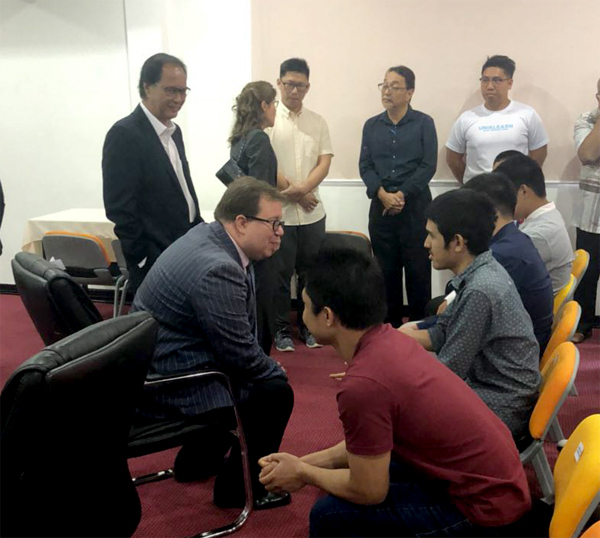 The recipients of the scholarships by An-Nur Harapan Sdn Bhd and Progresif Cellular Sdn Bhd into the UNIKLEARN programme were selected based on the main criteria of holding Bruneian citizenship, are 16 years old and above, and diagnosed with the autism spectrum disorder or any other related development delays with further assessment conducted for suitability of admission. The scholarship slots were limited to a few slots but regular applications into the programme will continue to be available. The programme covers intensive training and skills building on key skills area made by experienced therapists and advisors. Upon completion of their training, the youth in the programme will be provided with on-the-job training. They will also receive post-training support, including work transition support for subsequent internship or work opportunities. 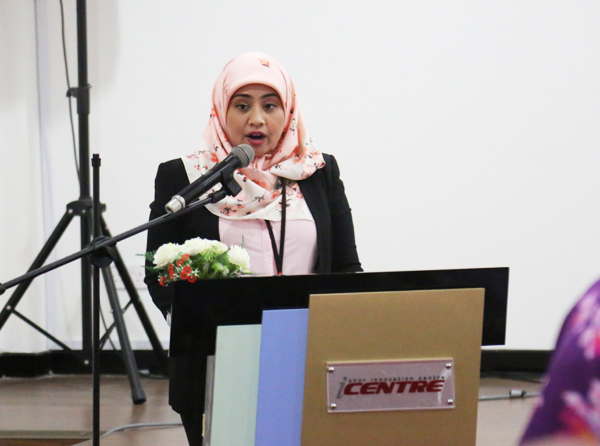 Also present at the award ceremony were members of the An-Nur Harapan Sdn Bhd board of directors, representatives from Progresif Cellular Sdn Bhd, along with An-Nur Harapan Sdn Bhd management and other invited guests. More information regarding the programme is available from the UNIKLEARN website www.UNIKLEARN.com. 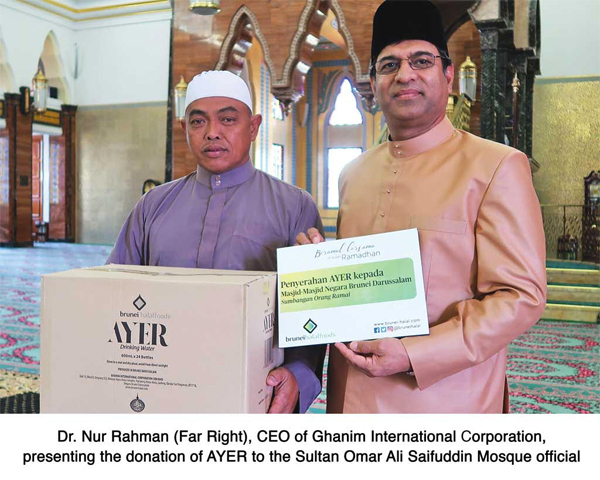 Ghanim International Corporation Sdn Bhd is at full speed this holy Ramadhan, distributing it’s first batch to more than 4,300 bottled oxygenated water to a number of Mosques in the capital as part of their ‘Beramal bersama di bulan Ramadhan’ donation initiative. 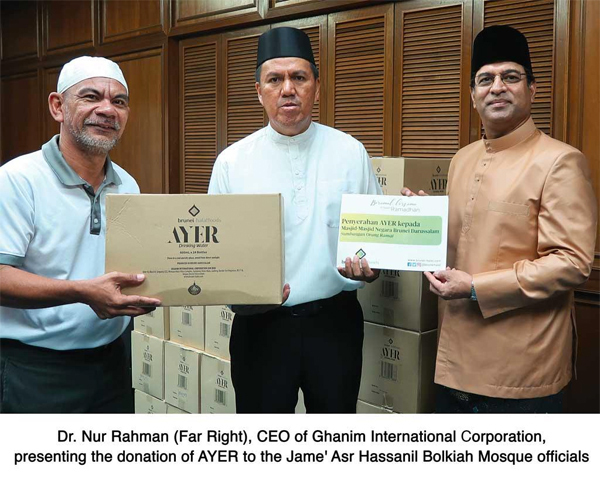 This first batch of deliveries is part of a month long programme of the distribution of bottled oxygenated water to mosques and individuals throughout the Brunei-Muara district generously contributed by the general public. 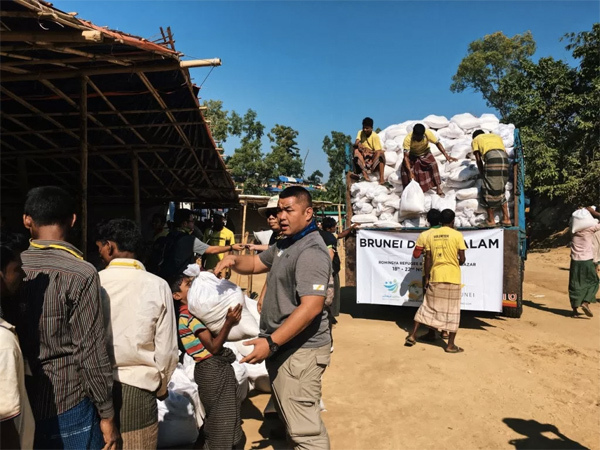 “This initiative is one of the many ways, bruneihalalfoods can be a platform for the public to give back to the community and helps to bring people together to engage with our communities,” said Dr. Nur Rahman, CEO of Ghanim International Corporation. “We are grateful for the continuous donations made by the public. 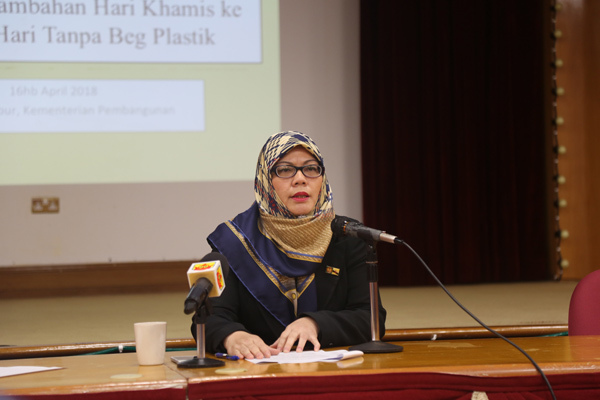 The ‘Beramal bersama di bulan Ramadhan’ campaign was launched in May 2017 where throughout the month of Ramadhan, the company opens donation channels for the public and distributes bruneihalalfoods products to mosques in which more than 14,400 bottled water were successfully distributed last Ramadhan. For interests and inquiries on the bruneihalalfoods ‘Beramal bersama di bulan Ramadhan’ campaign, information can be obtained through all of bruneihalalfoods social media platforms @bruneihalal or call bruneihalalfoods at +673 245 0279. Something great is happening next weekend. 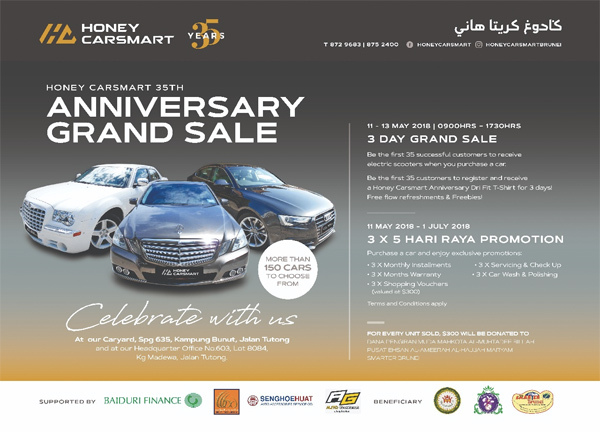 This time is 5 times better in terms of benefits compared to the previous annual grand sale from Honey Carsmart. From 11th May to 13th May 2018, Honey Carsmart will holding their 4th Annual Grand Sale and it is also in conjunction with the 35th year anniversary in this industry. As part of their 35th anniversary, the company will be giving away a unique electrical scooter for the first 35 customers during the grand sale period. On top of that, all the customers who purchased cars during the grand sale, they will benefit from the 3 X 5 package – a) 3 free monthly installments b) 3 free servicing c) 3 months warranty d) 3 free car wash and polishing and e) 3 free shopping vouchers worth BND 300. Now that’s a great value for customers. For the first time, Honey Carsmart will have the support from two financing companies (previously one) and now customers have the choice to choose between Baiduri Finance Bhd and BIBD At-Tamwil Bhd. The event partners will be Seng Hoe Huat accessories who has strong relations with Honey Carsmart and they will be displaying some of their accessories. Their audio systems and auto gadgets will be sold at attractive prizes. RedBull will be the other event partner. 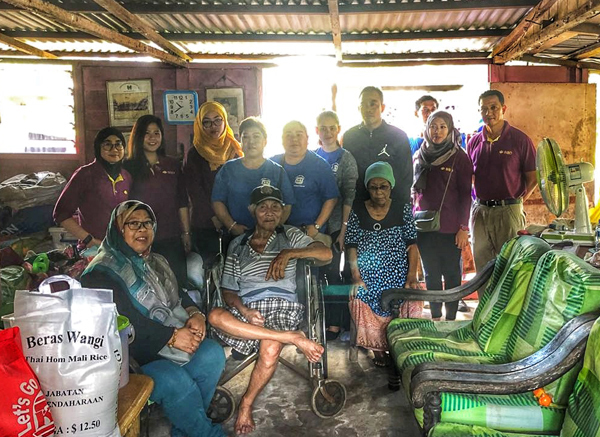 Honey Carsmart will continue the tradition in supporting and giving back to the community especially to the charitable foundations notably DANA Pengiran Muda Mahkota Al-Mutahtadee Billah, SMARTER Brunei and Pusat Ehsan Al-Ameerah Al-Hajjah Maryam. 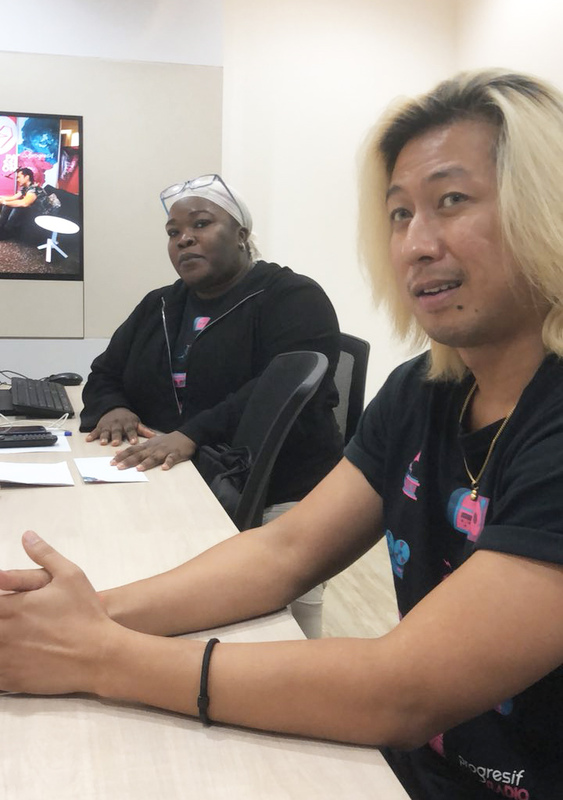 The company will contribute BND 300 for every unit sold within the 3 days and the charity pool will be equally distributed for donation purposes. Last year, they managed to raise a total of BND 7,500 where 25 units were sold. This year, they are optimistic that the numbers of units sold will increase as it’s almost the festive season. Wanna hear a refreshing biz idea? 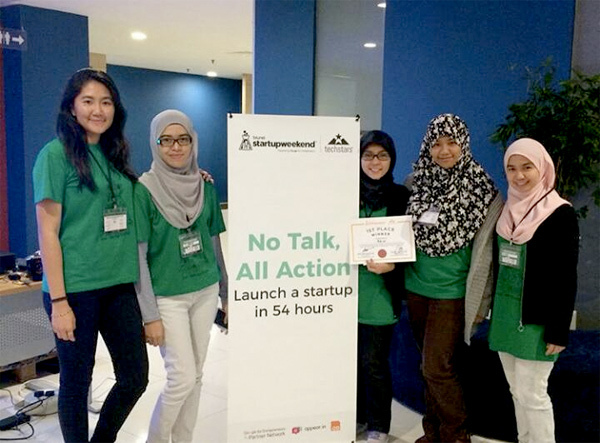 Sharifah Syuria Nazrah Malai Hj Hashim, Nurun Nazihah Hj Mustapa, Faten Amira Izzaty Joperi and Maydelyn Ling, the founders of BID.Co who came up with a brilliant idea of used baby equipments and gears. I hope your ideas will come into reality. Sometimes, it’s always to good to listen to refreshing business ideas. We are used to things like retail business or even in the tech world. Some are even similar or duplicates of one another. I, alone, struggle to find refreshing ideas on what works and what doesn’t work especially in Brunei. I had some successes and some failures along the way but it’s always to experience both sides of the spectrum because that’s how an entrepreneur will learn the ropes of success. Recently, I was surprised to see a friend of mine being involved in a Startup Weekend competition held at Laksamana College of Business. 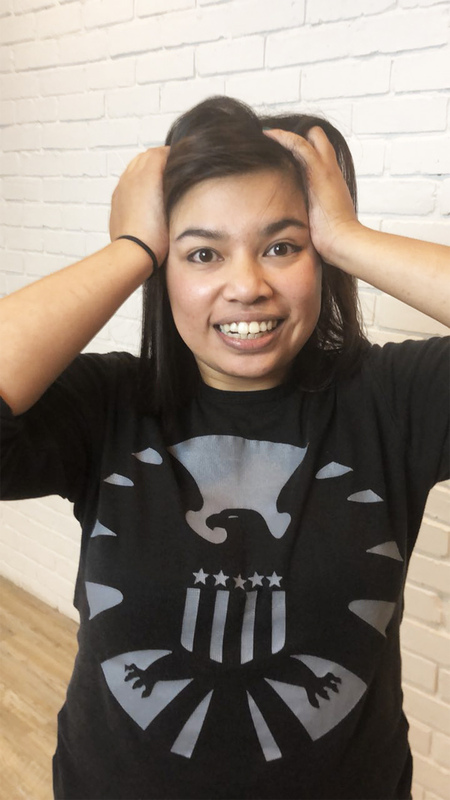 Madelyn Ling, a friend I knew from UBD Toastmasters Club, was part of the team called BID.co’s (Buy.Invest.Donate), that won the Startup Weekend competition. 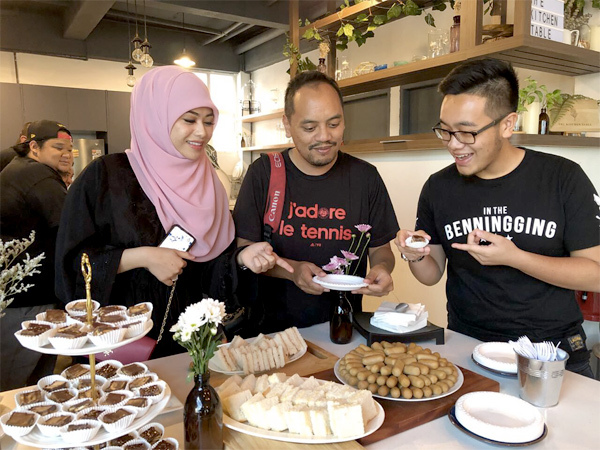 Now here’s why I feel that BID.Co’s has the edge – a totally refreshing idea and furthermore, it adds value to the community of Brunei Darussalam. 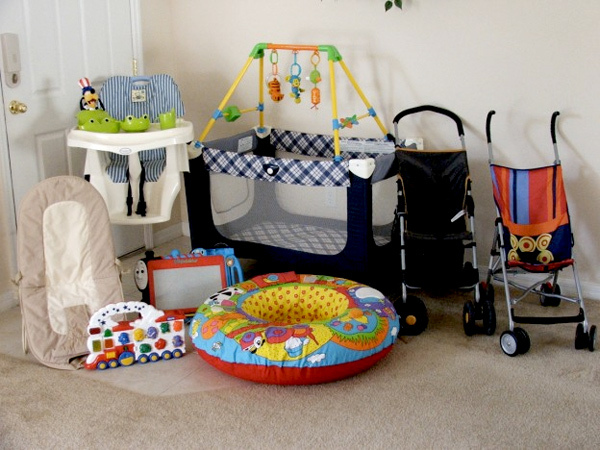 Imagine you have a storage full of baby equipments and gears at your home, collecting dust and purposeless since your children have grown up. What can be done with these equipments or items? This is where BID.Co comes in and presented their idea that they can be collect the used items and sell them at affordable prices especially for families who don’t have high disposable income. Furthermore, the portion of the sales will be used to raise funds for local NGOs as they are not easy to sustain. As long as the NGOs can be sustained, they will have enough resources to help the underprivileged community. 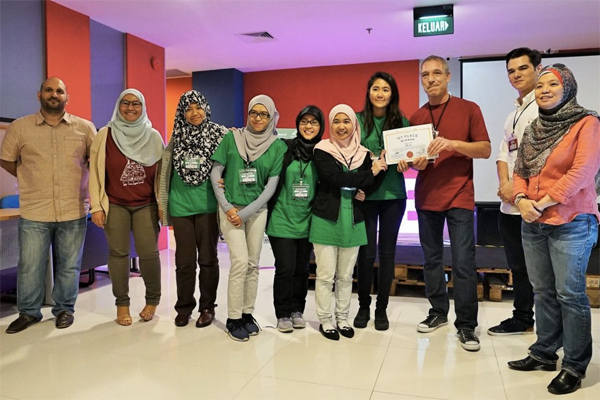 The founders, Sharifah Syuria Nazrah Malai Hj Hashim, Maydelyn Ling, Fatin Munirah Hj Sahrani, Nurun Nazihah Hj Mustapa and Faten Amira Izzaty Joperi, were over the moon as they were crowned the champions of the second Startup Weekend. It was something unexpected but now, the next step is to make this into a reality. The concept is there but it will be a long and fruitful journey in order to make this into a reality. According to Madelyn, it has been her dream and been conversing the idea to her family. 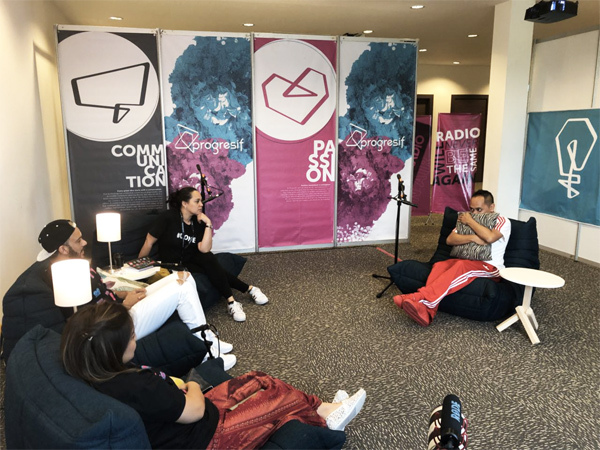 It was also the help of the mentors during the Startup Weekend to help them to be more focused and identify the underlying problems when it comes to baby equipments and gears. 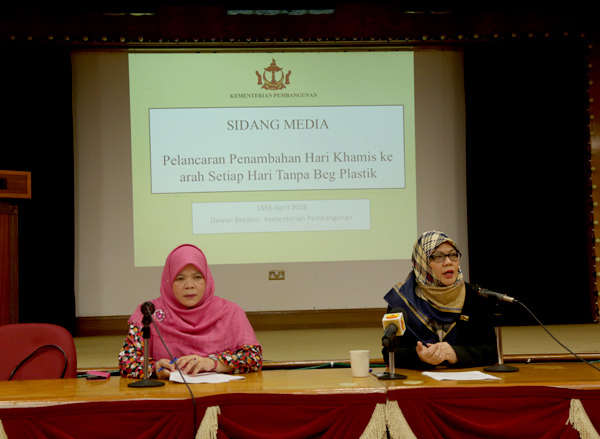 From there, they were able to identify how baby products and equipments are costly in Brunei and this idea of recycling used ones will provide alternatives to families in Brunei. 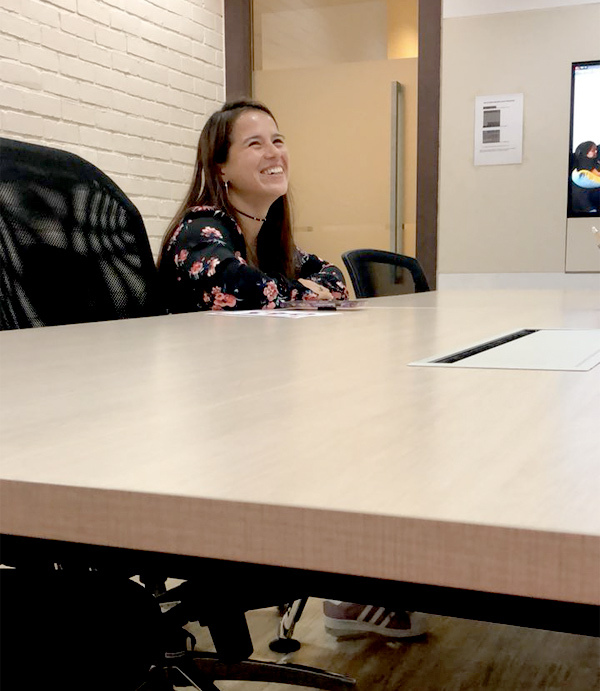 Madelyn also shared that she had no plans to enter the competition, thinking it was only a workshop by Startup Weekend. It was definitely a blessing in disguise. BID.Co team will head to Singapore in June to attend Asia’s largest Tech media platform e27. Awesome!!! Congratulations once again to all the ladies for winning and most of all, providing an innovative solution so we as a community can benefit. 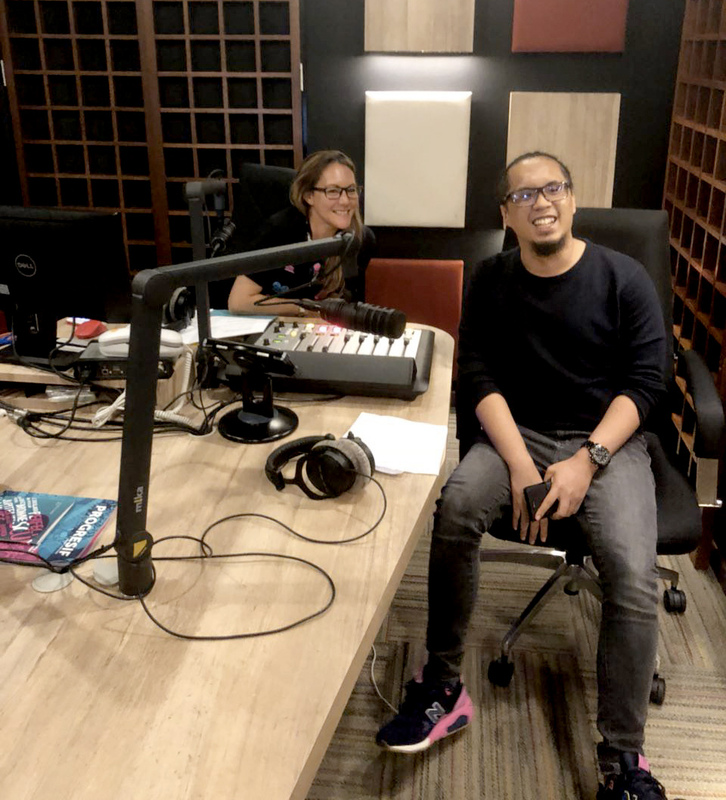 Bahzi Damit and Iqbal Damit, the co-founders of Hand4handBN, unveiled the upcoming crowdfunding for food packets to distribute for Rohingya refugees in Bangladesh. Click image to enter website. @hand4handbn has leveled up their game by means of donating through crowdfunding website in means to provide food packs for Rohingya refugees based in Bangladesh. This was announced at their press conference yesterday at Kitchen Table, Kiulap. As some of you know Hand4HandBN has spearheaded their own initiative to help the underprivileged community and they identified the Rohingya refugees as one of the beneficiary for the donations being collected in Brunei Darussalam. 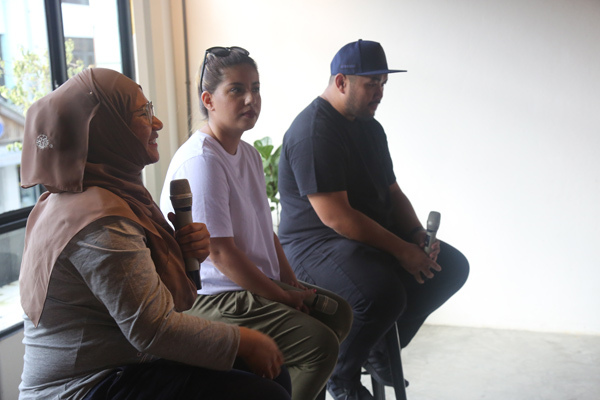 The press conference was led by Iqbal Damit, the co-founder of Hand4HandBN and accompanied by Fatin Arifin, Marketing Manager, Ghanim International Corporation and Ain Bandial, co-founder and editor The Scoop who both visited the refugee camps in Bangladesh back in November 2017. 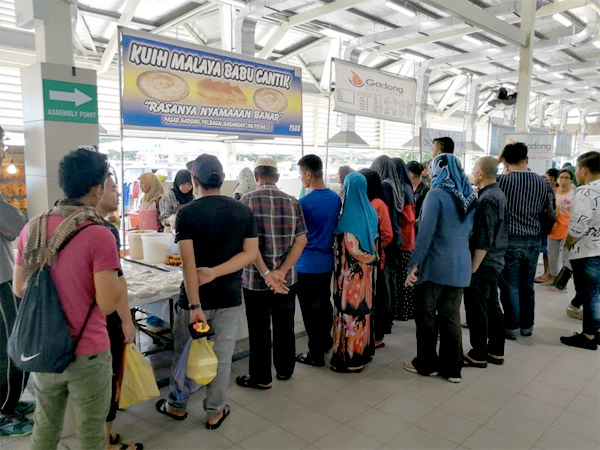 Iqbal Damit aims to reach at least 13,000 packs of ready-to-eat meals in the first week of Ramadhan. 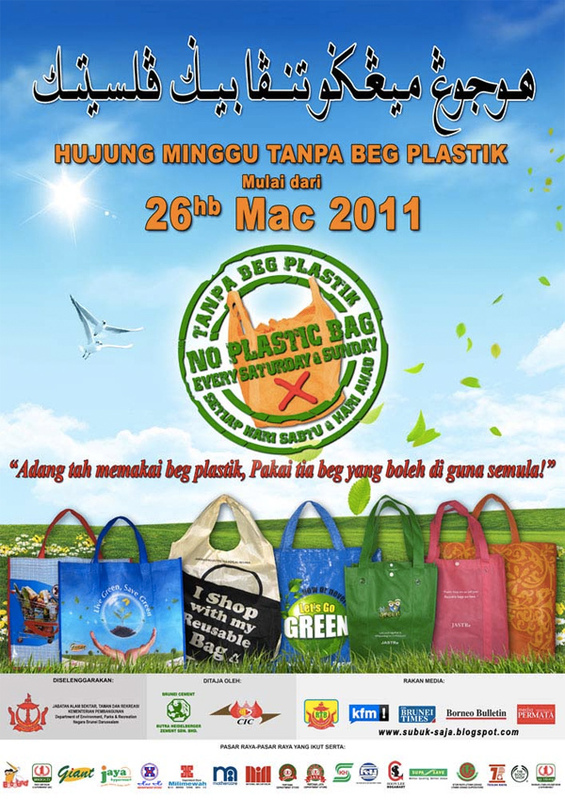 The packs are made locally by Saahtain Asia Sdn Bhd. The public now can lend a hand by raising funds through a crowdfunding website and for USD 15, you can sponsor 10 ready made to eat packs. USD 75 will provide 50 meals while USD 150 will provide 100 meals. Of course, the more, the better. With the crowdfunding website, this initiative will be global as well as it doesn’t just limit donors from Brunei Darussalam alone. The ready-to-eat food are much more convenient to the refugees as they don’t have to trouble themselves to cook. Donating things like rice and food items are common but the tougher part will be actually finding resources such as oil, cooking utensils and cook their meals. Hence, ready-to-eat packs are more ideal and effective when it comes to food distribution. 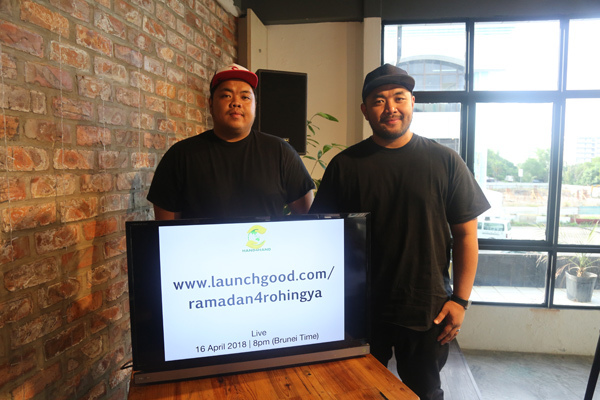 All you have do is, visit their crowdfunding website at www.launchgood.com/ramadan4rohingya and the donations can start from 8pm tonight, 16th April 2018. 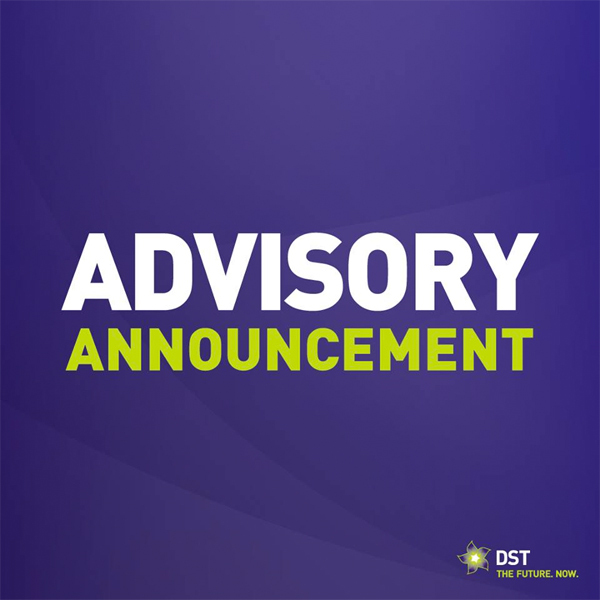 The last day of donation will be on 30th April to ensure a better preparation and logistics for the recipients during the holy month of Ramadhan. Let’s do our part in helping the families and children of Rohingya at Bangladesh. 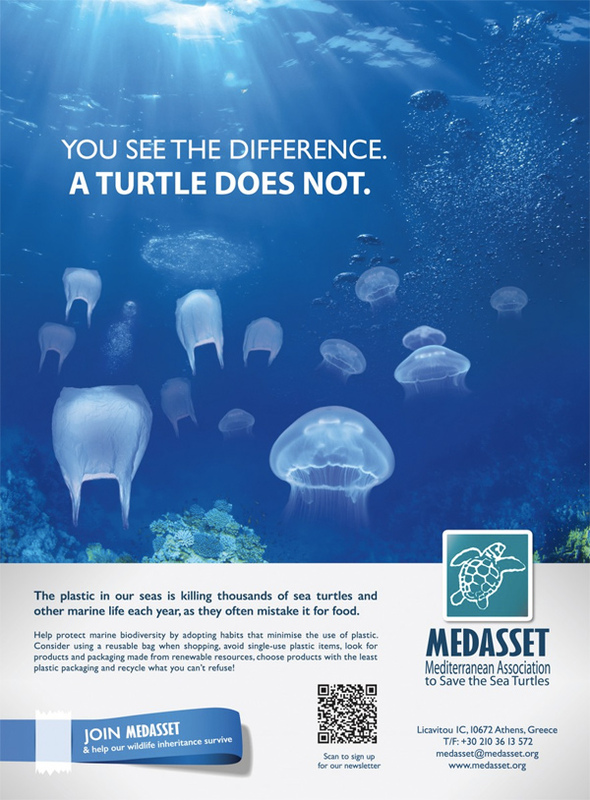 Our contribution can make a difference. Iqbal Damit at the Balukhali refugee camp in Cox’s Bazaar, Bangladesh, during the distribution of Bruneian food aid. Photo: Ain Bandial/The Scoop. You can read more story from The Scoop by clicking the image.